(CNS): With just over three weeks to go before Nomination Day, the political parties are now gearing up for their conferences this month, which will see the launch of the main campaigns for the UDP and the PPM as they prepare to do battle for the Legislative Assembly. However, with a host of independents, members of the current interim government and a full slate of Coalition for Cayman candidates expected to be running in the key districts, this will not be a head-to-head fight for the parties. Although the election statistics suggest that it is very difficult for independents to succeed outside single member constituencies, they can and will split the vote. However, depending on which of the two parties lose the most votes to the independents and C4C candidates, as well as how many voters stick with the former UDP incumbents, non-party votes will still have a significant influence on whether the PPM or the UDP forms the next government. While a coalition government remains a possibility, the largest group in the Legislative Assembly on May 23 is still very likely to be one of the political parties, but the question remains which one. While electors may chose to vote independent, C4C or for interim candidates, their choice will still indirectly influence the fortunes of both the political parties. Both McKeeva Bush, the former premier and the leader of the UDP, and Alden McLaughlin, the opposition leader and leader of the Progressives, are already pointing the political finger at the independents as much as they are each other. If McLaughlin and Bush have any common ground at all it is their agreement that party politics is here to stay and will still influence the parliament, regardless of the results of the May General election. The PPM have set their conference date for the 23 March, by which time all fifteen candidates running in the 2013 elections will have been revealed. The Progressive are expected to confirm the four men who will face the hardest battle of the election for that party in Bush’s constituency of West Bay this Thursday. Having already created a website ahead of the conference and with the 14 candidates who have already declared now on the ground and campaigning, the leader of the opposition told CNS last week that his team is ready and capable of winning this election. However, McLaughlin said that in his own constituency of George Town in particular, where as many as thirty candidates could be vying for a vote from the 7,500 electors, winning six seats will not be easy because of the vote split. If former UDP votes are given to C4C candidates, independent or interim government candidates, this is likely to boost the chances of the six PPM candidates in the capital, where the party still has a strong voter base. However, former PPM voters who choose to favour any of the non-party candidates will be boosting the chances of the six UDP candidates, which, despite the UDP’s uphill struggle in George Town, still retain significant loyalty among some parts of the community. With no membership base to rely on, most of the independent and C4C candidates running will struggle to reach the number of votes required for a seat in the capital but some are likely to poll significant numbers, splitting the party vote. Further strategic voting in George Town, where electors only use one of their six votes, will further undermine the chances of other independents, though it is clear that C4C candidates will be hoping that George Town voters will use all six to support their candidates — five of which have now been selected. While only two of the C4C candidates, Roy McTaggart and Winston Connolly, have been formally endorsed, Jude Scott, Jackee Haynes and the latest candidate to announce in the capital, Sharon Roulstone, are believed to have been given the nod from the C4C backers. Meanwhile, the UDP will be hosting its party conference this weekend, and although the party has not yet created a website or confirmed all of its candidates in the three key districts of Bodden Town, George Town and West Bay, Bush has committed to fielding the full fourteen candidates in those districts. The full UDP national team is expected to be announced at the conference when the party campaign is officially launched. Bush, who is still the subject of more than three police investigations and currently on police bail as those enquiries continue, is expected to answer bail on 19 March in connection with his arrest on suspicion of various corruption offences as well as theft, is likely to find the fight even in his home district the toughest he has faced since he was first returned to office in the district some thirty years ago. With two C4C candidates confirmed and all four PPM candidates to be confirmed this week in West Bay, the Bush opposition vote will be split, which is good news for the former premier, his long standing running mate Captain Eugene Ebanks and the two as yet unnamed West Bayers who will be joining the UDP platform. However, the two incumbents in the district and former UDP members, are also running with two other as yet unnamed hopefuls, which will, for the first time in the district, seriously split the UDP vote. Despite the on-going complaints about the quality of the UDP representation in West Bay over the last twelve years, the failure of those opposed to the UDP to unify has ensured a clean sweep for the UDP over the last three elections. But this time, as well as facing a full PPM line-up, as opposed to a loose coalition of anti-Bush candidates, the first elected member for the district will be facing off against his former Cabinet colleagues. Deputy Premier Rolston Anglin and Cline Glidden, the man who took Bush’s tourism portfolio after the interim Cabinet members voted with the opposition in a no confidence vote following Bush’s arrest, are both planning to run in the district. With some eleven weeks to go before Cayman goes to the poll, the outcome of this election remains decidedly uncertain but it will still be dominated by the parties, despite their dwindling popularity. Every vote will influence the outcome of which party will in the end take office, either as a majority or in a coalition cobbled together the morning after the night before. George Town, Bodden Town and West Bay…VOTE PROGRESSIVES all the way!! They are the party of doers, the C$C and the UDP are NOT for Cayman, but for foreign Investors and themselves. They are ONE and the SAME!! It will be wise for Rolston Anglin to join the PPM team in West Bay, because CG wants out and UDP do not want him. His best chance is to join PPM. If he soes, I will give him my vote, if not….he don't stand a chance. Too bad, that will be wasted talent. Why would PPM want him?? I hope the George Towners, do not follow the West Bayers and vote UDP/C4C? George Towners, please vote straight PPM. Do the right thing, do not let McKeeva get a leadership position again. You done know the West Bayers are going to put him back in, but if you put the C4C in along with the UDP GT Party, you will be voting for McKeeva's return as Premier. Its scary. Please George Towners, do the right thing. I got 6 wotes and I shall be wielding them like the sword of Damascus. Sword of Damascus? Is that like the sword of Damocles, only better? Don't you mean the sword of Damocles? Suppose PPM+C4C form a coalition Government after the May elections. When the dust settles, you can be sure that McKeeva will start working on his C4C buddies with promises of Ministerial seats and various other assorted goodies. He will not rest until his former colleagues cross the floor to his side and we will have the same situation as when he did this to Kurt. That said, perhaps we could rest easier if the C4C principals would “come out” and give us some assurances. Perhaps they are fence sitting and will jump to whichever side offers the biggest prize, for now. I dont think you have to worry about c4c crossing any line to join forces with mckeeva. Kurt and his group are famous for these moves. No, you don't have to worry about that because we already know that to be the case. C4C has been in the bed with Mckeeva for a long time. The question is, are they willing to get out of bed and denounce him and his co-horts publically? So far we don't see that happening. The only one of Kurt's group to join the McKeeva camp is Joey. As of recent, we don't have to wonder why. You need to spend a little time researching recent events. It is the ppm that said they wont work with c4c, not the other way around. The olive branch was extended to the C$C from the get go…Ezzard even wrote them a letter suggesting they sit and talk but just as Winston said on tv and the others on the radio; "We will not work with any party" so I dont understand how they will form a government that requires 10 successful candidates when they are only running 7 at this point? Smoke and mirrors lika all the comments on here…truth be told I think the C$C has already imploded where is Austin? where is Bo Miller one of the founders? where is Donavan Ebanks? Oh wait they arent Lawyers or major partners in firms…not a part of the choosen few! As soon as my new appliances are delivered I will decide who gets my four votes. Both UDP and PPM have themselves and their mismanagement to blame. Why should Cayman trust them and give the another chance? C4C strategy is to lump UDP and PPM together. The reality is that PPM’s downfall was the worst recession in our lifetime. Yes, they invested alot of money in infrastructure, but based on income projections at the time, the investments were feasible. UDP on the other hand, were both incompetent and corrupt. They are like drunken sailors, spending the country’s money with absolutely nothing to show for it. C4C principals, having supposedly severed their ties with the UDP, now want to make you believe that UDP and PPM are cut from the same cloth. Not so fast C4C, it is well known that you were in fact the machinery behind McKeeva until you lost control of him. Rest assured you are not fooling all of us and hopefully you too will be held accountable in May. I like the Independents and think anyone voting with a party needs their heads examined. The people have been blindly following these two parties for a decade. Wake up!! The two-party system has been the ruin of our beloved country. The career politicians promise you the world and give you a cup of dirt. They have wasted money, appointed corrupt cronies to Govt Board and Authorities, lined their pockets and have done nothing for this country but blame the other party for their own failures. I'll be voitng for the Independents or based on people's merits, not the color of the t-shirt they wear. I'm shocked, saddened, and surprised that intelligent Caymanians cannot see past the party politricks. I urge the people to educate themselves. Read this article on the history of party politics in the Caribbean. It is a balanced and fair view, then tell me if a population of only 60,000 really will benefit from a political party system. When C4C own up to the deception they have been perpetrating for the past 6 months, when they acknowledge their ties to McKeeva and some of the minoirty government, when they tell us how they expect to run a Westminister style government as independents, when they tell us who they plan to form a coalition with then perhaps, just perhaps, I'll give them consideration. Seems to me right now that they are just a bunch of rich spoilers with solid links to McKeeva and company. C4C it takes 10 to form a government. Who are the rest? Status and VOTING, This Party back and fourth goes on in every Country that embrace Democracy, here is a list of some for you. And this list can go on……. And also this list can go on…. If these Countries I mention is any indication that Party Politics is here to stay, I say no more, forget the Independents, just like the article says, your vote is going to benefit one of the Parties, which one? Now that's the good question that is left for you the Electorate to answer. My advice, choose a party that meets your believes, NUDP or PPM. Just like in the USA you have the Republicants and Democrats, the UK you have the Tory Party, Labour Party and the Liberal Party. Just Choose a Party. Then you would not need to have your head examined. For those who support Party Politics, no need to have your heads examined, keep doing what you all are doing. 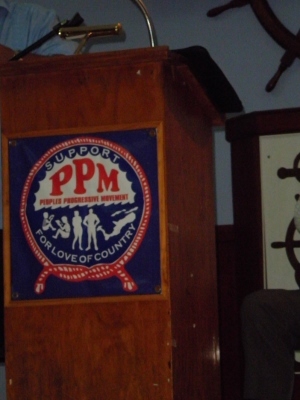 For the LOVE of Country & these Cayman Island and its people; The PROGRESSIVE All the way! !